Can you believe I've been doing this for a year now? Yep, one year(and 6 days) has passed since I did my first 5-panel version of the graphic novel known as Kingdom Come. 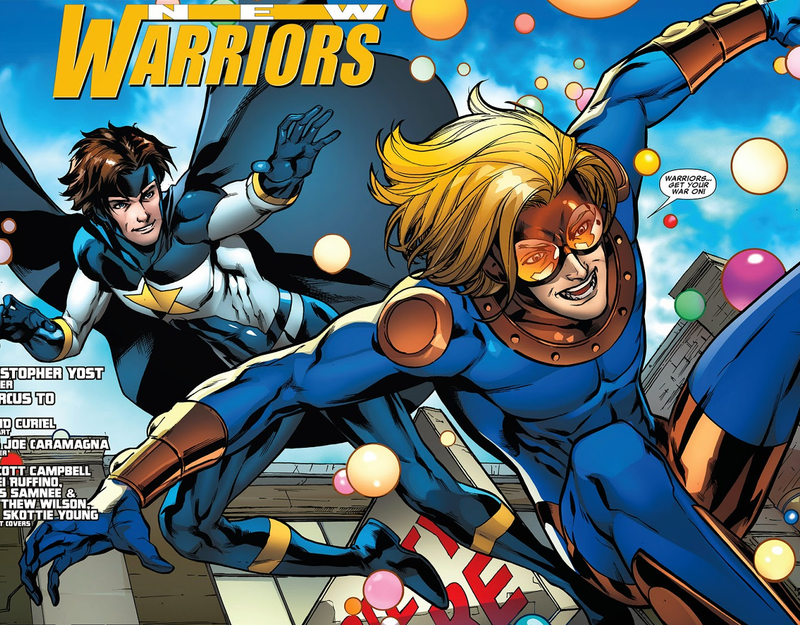 And that is why I will review a series I have promise long ago to take a look at: New Warriors, written by Christopher Yost. This is one of those series where people has said that it either will be spectacular, or be a poorly written piece of crab. 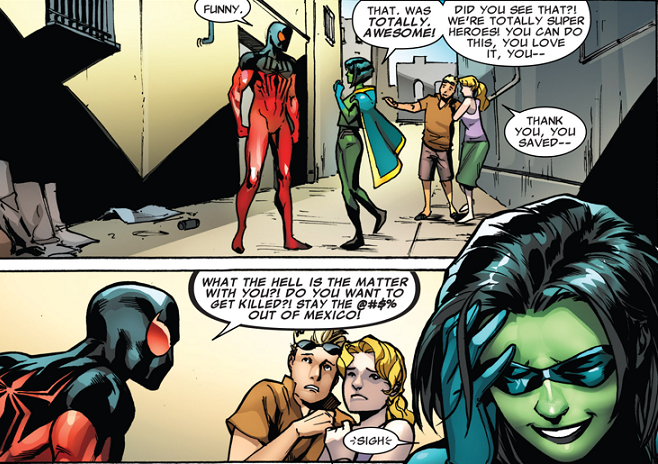 The later has been argued that it will, because: A) Scarlet Spider, who are part of the team, is going to fill up too much due to him being pretty popular after a 25 issue long solo-series, and B) Speedball(once known as Penance) was too happy and "out of character," since he is suppose to be depressed. ... This is the problem with being a comic-fan. The people you find on forums to talk with about your common interest can many times be cranky nerds who just want to complain about how stupid something is long before it has been published, and with meek points. And I am happy to say that they were all wrong. Let's take a look at the first four issues, shall we? First of all, I simply can't give Marcus To's art enough praise. It's simply gorgeous! Not too real, not too cartoonish. And the coloring is great too. Our comic starts out with a cow-lady being killed by the villain(?) named High Evolutionary. He is a not-exactly villain who created man-animals because evolution and stuff, and do to the event of Infinity(where allot of humans has become "inhumans," do to gas from Black Bolt) he believes that Earth is soon to be judged, and that he has to cleanse the planet for everything not human, so that it can be spared, starting with his own creations. ... Not exactly how I imagined the first issue of the new NW series. The Warriors has usually faced not so high profile foes(with an exception here and there), but then again, they have evolved a great deal since they started out in the 90's. Just take a look at what is left of the original team: Justice, who started out as the awkward Marvel Boy with low-level telekinesis is now a former Avenger, been a mentor for teen-heroes both in the Initiative and Avengers Academy, and his telekinesis seams to grow more powerful for each day there goes. And Speedball, who used to have little to no control over his bouncing, and had to depend on dump luck, can now control his at first seemingly silly power, which has evolved in his time as Penance. So maybe it's only reasonable that they have a heavy-weight foe, especially since the going-to-be team also has an improved Spiderman-clone and a demigod. I bow before your uncanny ability to predict FOUR MONTHS before a series is going to be published how it's going to be. You were completely right! Clearly the two of them fill up too much with a total of four pages! I mean, Speedball and Justice only have six! And they totally don't have proper buildup, so new readers who don't know them wont have to read Scarlet Spider first. Kudos to you, and your well-based opinions. Alright, sarcasms aside, this is a pretty good first issue. Sure, we don't see to much of the other characters, but you sense that it's building up. My favorite part is a classic "hero mistake other hero for villain" fight with the team Salem's Seven, which result in an interesting conversation between Justice and S7 leader Vertigo about having a past against you. 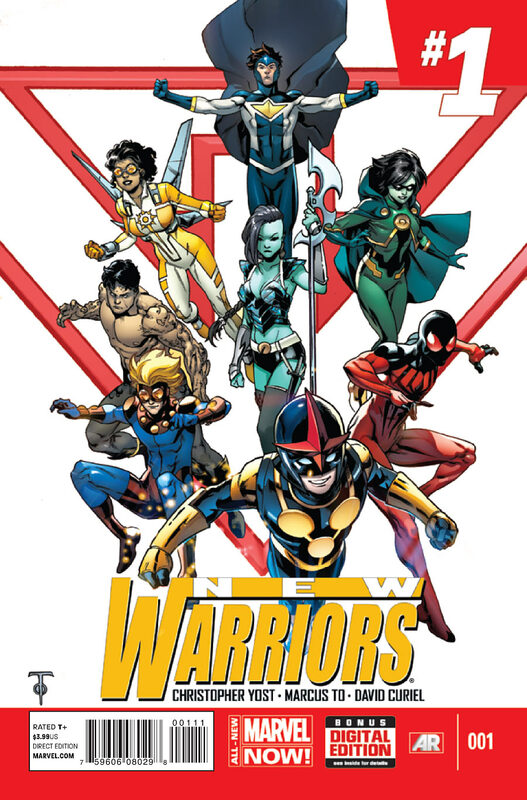 Because this is what the new NW series is primary about: Redeeming the New Warriors, who had a bad name since Civil War. That is the opening story collected in issue 1 to 4, and I have to say that it's pretty good. We are introduced to all the characters, we have established why they band together(even though they aren't all to warm on the idea, but they stay at the moment), and it's colorful and funny to read. And that is not all: It's clear that Yost has done his research on the Warriors' history, it's even mentioned that they know the Black Bolt and the Inhumans from one of their earlier adventures. I enjoyed this series, not only as a NW fan, but also as a comic-fan who want to read a team-book without X or Avengers in it's name. Too bad To stopped being the artist after issue 4. 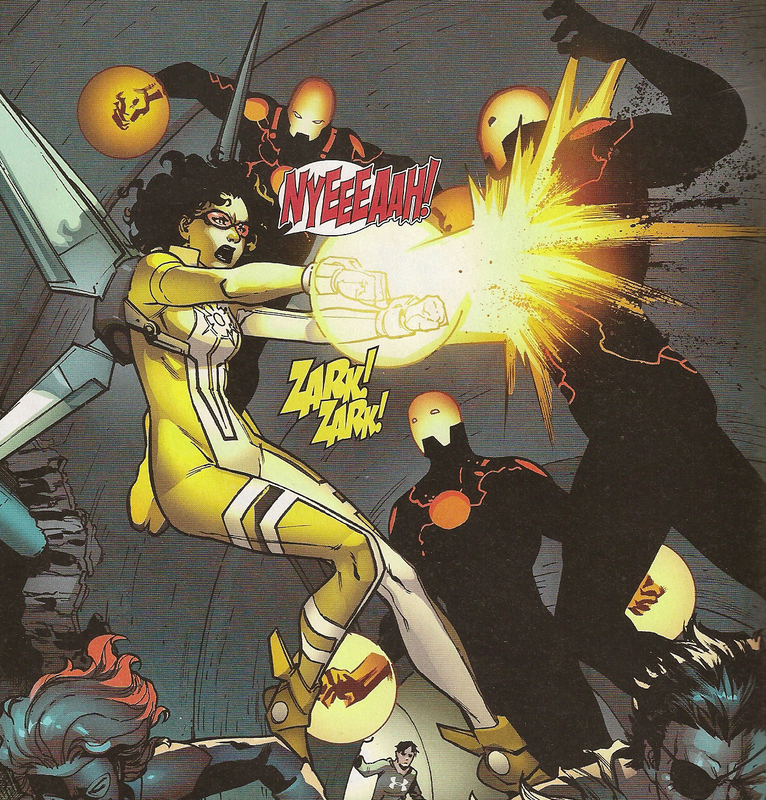 But with Yost as writer, I predict that the fifth "New Warriors" series is going to be superior to the first. W2 and Eyz talk: Justice League; Generation Lost. The Dark Phoenix Saga in 5 panels. Quest For Lost Comics: The Titans 1-20. Liar Game in 5 panels. Animal Man; Deux Ex Machina in 5 panels. New Avengers; Everything Dies in 5 panels.